When we think of watches Jaquet Droz we usually think of the Grand Feu enamel dials, the warm, bright – and at the same time mysterious – shades of red gold, the Grande Date, the hand-painted dials, and much more that leads us directly to the ancient and traditions. Instead, reflecting the Maison La Chaux-de-Fonds is from the very depths of his heart has always been a manufacturing innovative and since the beginning of its long history, projected into the future. To remind us are the first Droz automata, parent – child and Lechot. Could therefore never miss the mark in its timepieces the values of sport, of our own time? Of course not. In the line of sports watches Jaquet Droz SW innovative materials are in the foreground. They are combined with those noble, with the natural rubber and treatment in Super-LumiNova, with the result of obtaining a visual effect of great impact. Here are two clocks SW emblematic. 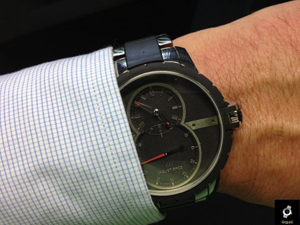 That’s right: the classic of classics (Grande Seconde) Jaquet Droz, welcomes with open arms technology. With the Grande Seconde SW Steel-Rubber, Jaquet Droz has drawn the best from their technical knowledge and philosophy. Grande Seconde SW Steel-Rubber – live photos (rubber bracelet available from November 2012). Design – revolutionary at the time (1785) – the Grande Seconde artisans have made to converge new materials that renew the pioneering spirit that has always characterized any “thing” came out of the hands of the family Droz. By the end of the 18th Century that original eight “enlightened” smelled of the future. The purity of the lines of the dial is the result of a complex process of reduction of matter performed on a single block cable. The balance of the eight elegant satin finish, the refinement of the profile, the treatment of the red Super-LumiNova hands and some indicators point to the deep black in a sophisticated game of volumes, colors and light. Also cut into the mass indexes reveal a predominance of roundness with discretion. The Grande Seconde SW Steel-Rubber is a watch extremely comfortable: with steel combined with the rubber is light and pleasant to skin contact. In 2011, it was a surprise to see the tourbillon cage a circling inside the iconic and magical number 8. 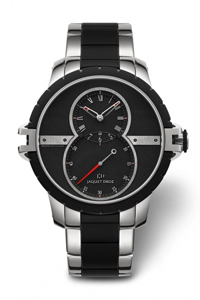 In 2012, Jaquet Droz has for the first time in its complication associated with this elegant sporty SW founded in 2008. Inserted at the top of the dial, the tourbillon shows the extraordinary complexity of its mechanism. The upper deck has been modified to act as a second hand. In the Grande Seconde SW Tourbillon elegance and sportiness alternate with great harmony just as the second hand from the classic profile in response to the sporting spirit of the model. Front counter of the hour and minute indicators incorporates the classical manuscripts in Roman numerals. However, as the hands, the latter are coated with a layer of Super-LumiNova white, which contrasts the black of the dial treated rubber. Placed horizontally, indexes applied and screwed emphasize the balance between graphics and harmony expressed by the tourbillon. The large box 45 mm in diameter shines the brightness emitted precious red gold, which also points out the grooves on the bezel. The alligator strap, unusual for this line, is there to emphasize that sport or not, it is always the top model in the luxury collection SW.